The birth chart of the Presidents or the Kings can be consulted like universal one’s in world astrology for their countries and more still for the “World Number One”. We must understand that they have not any direct responsible in the exposed facts. Top of Nasdaq: The cotation of the Nasdaq reached its historical top 5 048.62 points on March 10, 2000. Age : 53,67 years old. Period Mars-Venus (until April 4, 2000). Point of convergence of the circle of the years: 15°20′ of Pisces on a degree pertaining to the Sun (13°47′) and to the Moon (16°43′). This sector has a middle force in House VIII. 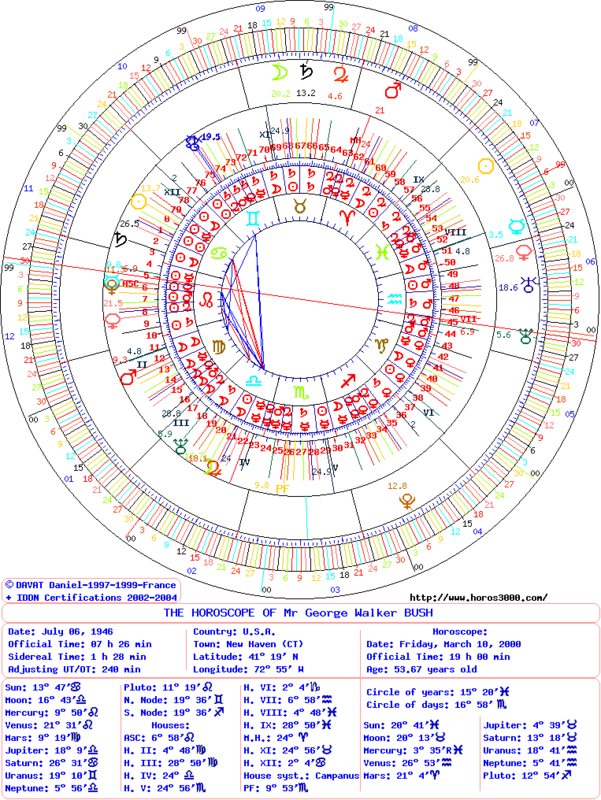 Position of the degree of the day: 16° 58′ of Scorpio on a degree of the Moon (16°43′) and Jupiter (18°09′). This sector has a Powerfull force because it is united with the Part of Fortune. The degree of the year positions on a point of convergence of the Sun and the Moon which do not have affinity with the stock exchange speculation, in Pisces and in the House VIII. It is unites with the Part of Fortune that has a powerfull force. It has an analogy with profits and fortune. This degree is under the influence (by aspect of 30°) of the Moon-Jupiter conjunction. Jupiter has a very beneficient quality in Scorpio. It has also an analogy with ease, success and chance. It is located in conjunction with the House V, that of the stock exchange speculation. In this chart, the sector of the zodiac starting from the conjunctions of Jupiter, Moon and House IV more the aspect with Part of Fortune and the House V form the sector of success, richness and speculation! On December 08, 2006, the cotation of Nasdaq was at 2 443 points. This entry was posted on Thursday, January 10th, 2013 at 9:51 pmand is filed under Finances. Both comments and pings are currently closed.